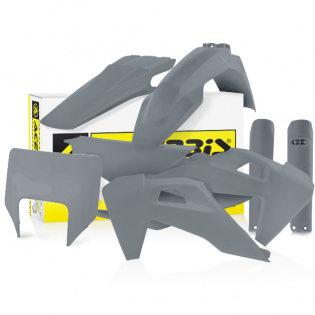 The Acerbis Husqvarna Plastic Kits are the easiest and cheapest way to replace your bikes plastics. Here you can purchase a basic replacement plastics for your bike made by Acerbis, one of the best choices for off road spares and have the original factory shape of the according model. Acerbis plastics kits come as standard manufacturers colours. Acerbis plastics are used by some of the biggest teams in Motocross & Enduro across the globe including Pro Circuit, Monster Kawasaki & Monster Yamaha, and the Factory KTM team to name just a few. Kits are Constructed from Durable Gloss Polypropylene. Glossiest Plastics on the market. Rigorously Tested, both in the Lab and on the track in the Heat of World Class Competitions. All kits come with white side panels.